These cupcakes are so good! We brought them in to our Latin class for fun, and they were just right since it was the first day of October- the flavors are perfectly in season! Everyone who had one loved them, so we will happily make them again sometime soon. The homemade caramel sauce is what puts these over the top. If you have never had or tried to make homemade caramel sauce before, it’s not too hard and it is way better than store bought and is totally worth the extra effort! These cupcakes are not healthy at all, thanks to a lot of butter and sugar (we’ll be sharing a healthier recipe in the next day or two), but if you are going to eat the calories, you might as well spend them on these! To make the brown butter pumpkin cupcakes: preheat oven to 325 degrees F. Line muffin cups with paper liners and set aside. In a saucepan, melt the butter over medium-low heat and continue to cook, swirling occasionally, until butter turns golden brown, Skim foam from top, and remove from heat. Pour into a bowl to stop the cooking, leaving any burned sediment behind; let cool. In a medium bowl, whisk together flour, baking powder, salt, cinnamon, nutmeg, and cloves. In another bowl, whisk together the pumpkin puree, sugars, eggs, vanilla extract, and brown butter. Add the flour mixture, and whisk until just combined. Divide batter evenly among lined cups, filling each three-quarters full. Bake, rotating tins halfway through, until a cake tester inserted in centers comes out clean, about 20 minutes. Transfer pans to a wire cooling rack and cool completely before removing cupcakes. 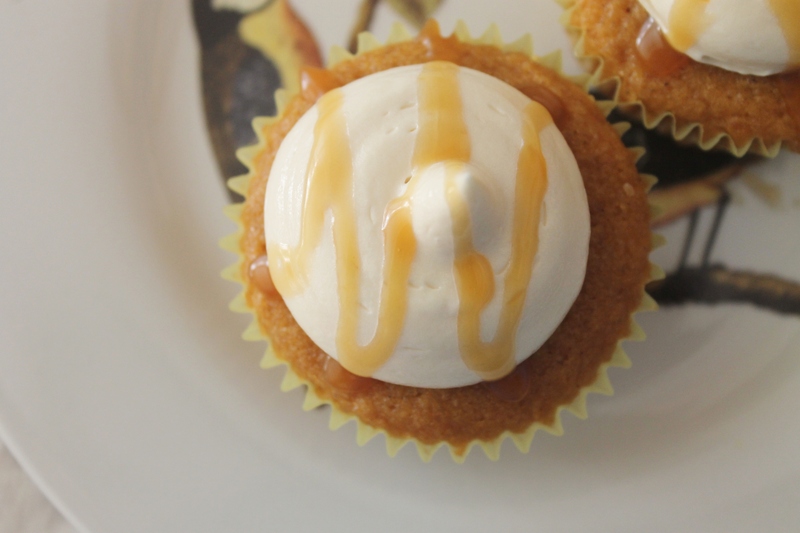 While the cupcakes are cooling, make the salted caramel frosting. First, make the salted caramel sauce. Make sure you have all of the ingredients ready. Once you start the caramel sauce you have to pay close attention so you don’t burn it. To begin, heat the sugar over medium high-heat in the bottom of a heavy 2-3 quart saucepan. When the sugar starts to melt, start whisking the sugar. The sugar will clump up, but keep whisking. It will continue to melt. When the sugar is melted, stop whisking. You can swirl the pan to move the sugar around. Continue cooking the sugar until it reaches a deep amber color. Make sure you watch the pan very closely. This is where it is easy to burn the caramel. You want the caramel to reach 350 degrees F. If you are new to making caramel, I suggest using a thermometer. Remove the pan from the heat and carefully pour in the heavy cream. Whisk until cream is incorporated and caramel is smooth. Whisk in the fleur de sel or Maldon sea salt flakes. Let the caramel sauce cool for about 10 minutes in the pan. Pour the caramel into a large mason jar and cool to room temperature. To make the frosting: beat the butter in the bowl of a stand mixer fitted with the paddle attachment on medium-high speed until light in color and fluffy, about 3 minutes. Reduce speed to low, add powdered sugar, and mix until completely incorporated. Turn off the mixer, and then add the salted caramel sauce. Beat frosting on low to combine, and then increase to medium-high and beat until airy and thoroughly mixed, about 2 minutes. 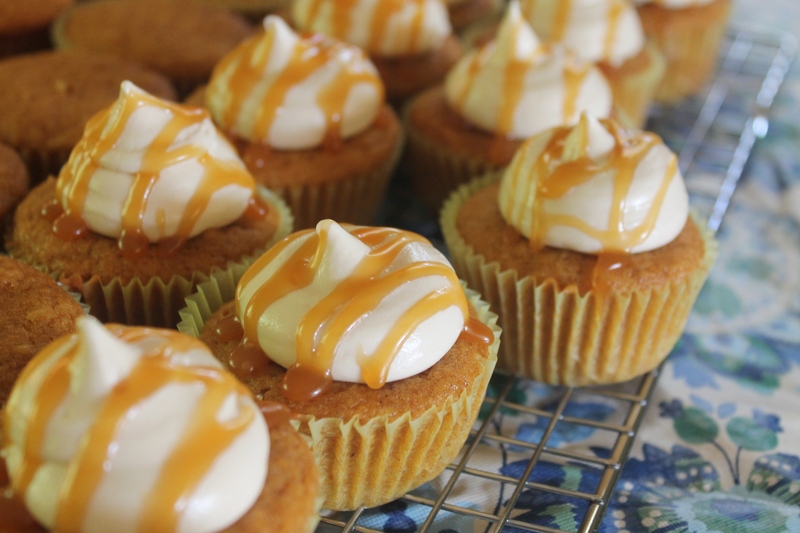 Frost the cooled pumpkin cupcakes with the salted caramel frosting and and drizzle cupcakes with extra salted caramel sauce, if desired. Enjoy! Side note: You’ll have extra caramel sauce. Store it in the fridge for spooning over ice cream or making into another treat, which we will be sharing later this week! Yummy. Looks amazing! loved it!